So what happens when you have a friend who gets a kick out of planning themed parties? You get a themed birthday party…whether you really want it or not. Fortunately, my dear friend, is a fan of BBC’s Sherlock. This is helpful, because I really wanted to throw a Sherlock themed party. Remember my Doctor Who Birthday Party? I’m now hooked on themed parties, because they are so much fun to plan. One of my New Year’s Resolutions is to spend more time with my friends (an unwritten one is to not get myself in over my head). Parties are ideal for getting my favorite people together in one place. The challenge is not getting carried away with the theme planning. 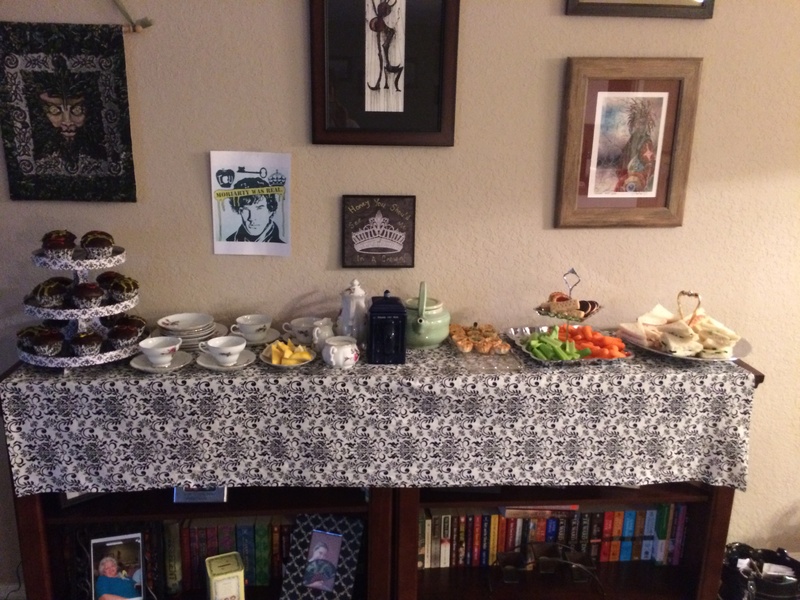 For this party, I decided to serve tea as a subtle (or not so subtle) reference to Sherlock serving tea to Moriarty in The Reichenbach Fall. 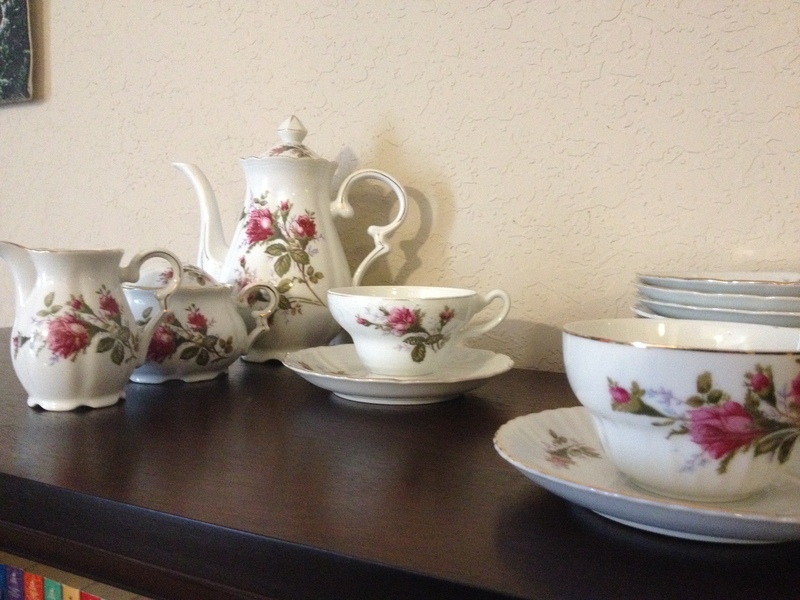 Besides, I’d just unearthed the tea set my Grandma Joye got for us to use when we were kids. She would have definitely approved. My parents are remodeling their kitchen, so I helped them clean out their current cupboards. We found all kinds of gems there. Serving plates, dessert trays, and even a fondue pot. (I’ve never had fondue, so I’m not attempting it for the first time at a party. However, this is not my last theme party!) My kitchen cupboards are a little short on space now, but I have a lot of really neat stuff that will be put to good use! I didn’t get to do all the decorating I would have liked. (Note: don’t plan a themed party when you’ll be traveling for work the week before. It makes everything feel rushed, and fun stuff has to get cut do to time constraints.) The writing was on the wall, so to speak, with Dry Erase markers providing the assist for “Get Sherlock” messages and “Honey, you should see me in a crown” on the bathroom mirror. The mirror was complete with a crown drawn just above the head of the viewer. As a parting shot for party goers, I printed a picture of Moriarty with “Miss me?” at the bottom. Since a number of people hadn’t seen all the Season Three episodes, I provided “shock” blankets, because…they’d need them. The blankets were simple to make. Orange fleece cut to whatever size you desired with hems around the edge that were whipped stitched with dark brown embroidery thread. I’m a fan of decent sized blankets to snuggle in, and the bolt of fleece I found was perfect for that. At 60″ X 54″ there’s plenty of soft cuddly comfort to be found. The menu consisted of items typically found at tea-time, and the bonus was it was quick and easy to put together. 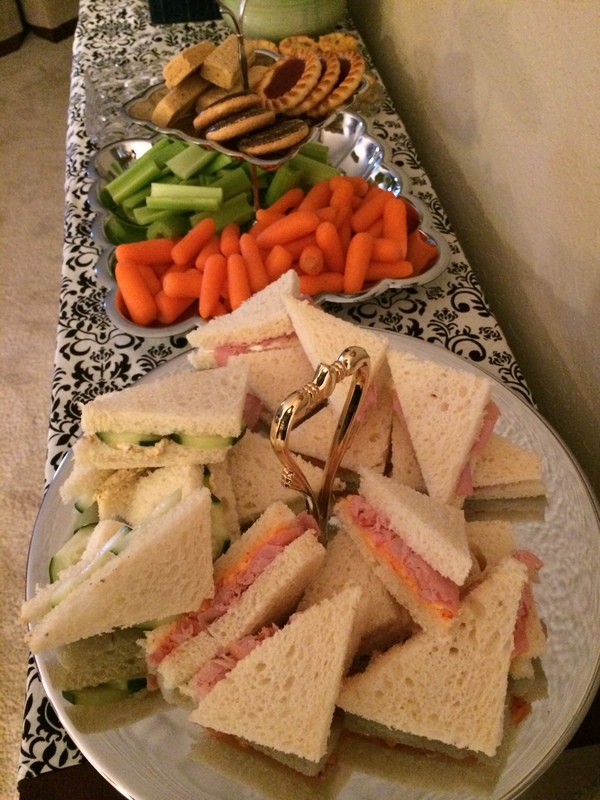 Cucumber Sandwiches – spread: 8oz cream cheese, 1/2 cup mayonnaise, 1 packet of dry Italian Dressing seasoning. Mix well and refrigerate for at least 6 hours. Spread on bread and top with sliced cucumbers. Adagio Teas has a wonderful selection of fandom teas. I ordered the Sherlock Sampler. 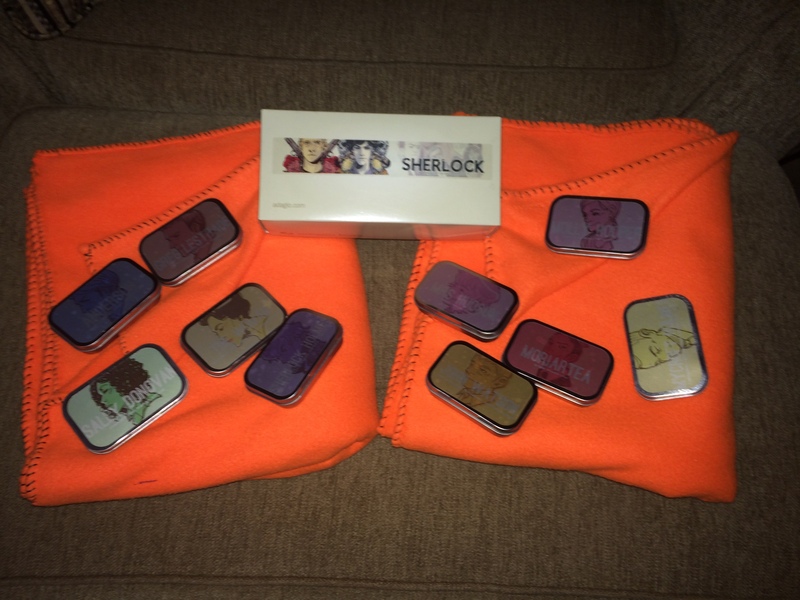 Which arrived with tea specially blended based on Sherlock Holmes, John Watson, Mycroft Holmes, Anderson, Sally Donovan, Greg Lestrade, Mrs. Hudson, Molly Hooper, The Woman, and Moriartea. They’ve pared down their current sampler size and price, but after tasting most of these teas, I think they’ve made good selections. My favorites were Sherlock Holmes, John Watson, Moriartea, and Greg Lestrade. I like a bold strong tea with a bit of milk and sugar, and these were all perfect for that. Mycroft Holmes was also really nice, very chocolaty. A Sherlock & Watson Cocktail was also in the plans, but it calls for Cardamom Bitters. I had no concept of how difficult it would be to find this necessary little addition, so...we just splashed whiskey in our tea and called it a day. You can order Cardamom Bitters online or check your local specialty food stores. Just plan ahead for that little gem. We played “Sherlock” , a game I read about online that combines Clue with Jenga (the Lego guy was my idea). Setup the board just as your normally would for Clue, however in the center where the envelope containing the killer’s information goes, place the Jenga tower. The Lego figurine goes on top, since there is no Sherlock Lego yet, I used Loki (I didn’t think he’d mind.). We played with traditional Clue rules, however each time someone made an incorrect suggestion to solve the murder, they had to remove a Jenga block. 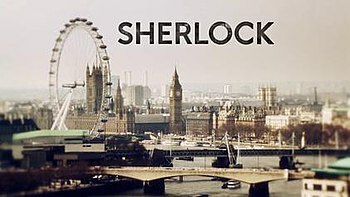 The person who makes “Sherlock” fall loses. Yes, someone went there, I ran with it, and it was good. 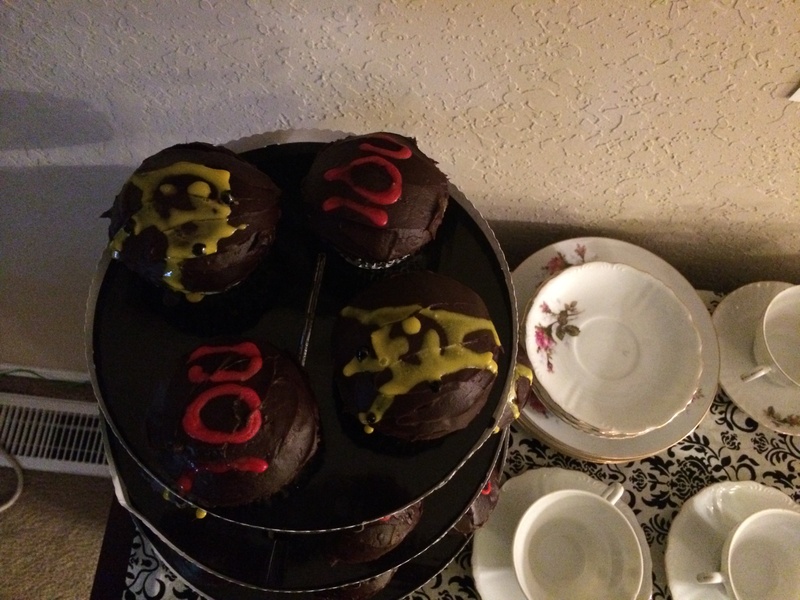 The “spray paint” effect did not go as planned…but they still tasted great! The party was a grand success, and I will be keeping my list and props intact for the next Sherlock party. Watch party for Season 4? Anyone? Anyone? Since I have a good bit of time to plan for the next one, send me your ideas.